The 2013 MLB Amateur Draft is just two days away and teams are busier than ever, making last minute adjustments to their draft boards and reassessing each of their potential draft day selections. Although this year’s draft is not as star-studded as past years, there are a number of high school and college prospects that comprise a very talented outfield draft crop. 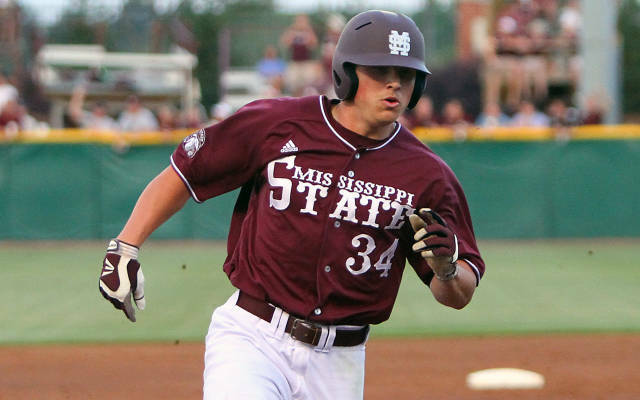 Below we have listed the top ten outfield prospects that are available in this year’s draft. Frazier has outstanding bat speed and raw power, as well as all of the tools to become an all-star outfielder at the next level. Frazier has the hitting ability, power, speed, glove, and advanced approach to the game that will impress many clubs on draft day that will be looking for a solid building block to their franchise. Like Frazier, Austin Meadows is a highly talented, toolsy prep star out of Georgia – they’re even longtime childhood friends. Meadows is a superb athlete with tremendous five-tool projection, possessing a strong arm and a quick, powerful bat that will gain power as Meadows grows into his strong frame (6-3, 200). Renfroe is another toolsy outfielder who has been gaining considerable attention as the season has progressed. Renfroe has five-tool projection, showcasing raw power that will develop stronger and a rocket arm in the outfield. Watch out for Renfroe to climb the draft boards early on Thursday, as this “Hunter Pence-esque” prospect has impressed a lot of clubs. Ervin is the epitome of pure speed, as he brings plus speed in the outfield and along the base paths. Ervin has the projection to become a pure hitter with good plate discipline, ability to hit to all fields, and decent pop. His defense has garnered him much attention, as he has displayed a superb glove in centerfield this spring to go along with his plus speed and range. Although his numbers don’t necessarily portray it, Judge possesses excellent raw power that was showcased in the Cape Cod League this past summer. Judge’s large, strong frame (6-7, 240) gives him the projection to become a physically imposing slugger with plus power at the next level. For a big man with a big swing, Judge has great plate discipline, can run for decent speed, and offers an impressive glove in the outfield. Despite missing much of the first half of spring with a stress fracture in his elbow, Wilson has rebounded back and showcased his ability to project as a legitimate five-tool player at the next level. Wilson possesses plus hitting ability, solid raw power, good defensive skills, and overall athletic ability, all of which define a solid and desirable right fielder. It can be argued that McKinney possesses one of the best pure high school bats in this draft, wherein a smooth swing and a polished offensive approach project him to become a dangerous plus hitter in the big leagues. McKinney has an overall solid game and is a team player, in that he would become an asset to any professional clubhouse in terms of ability and leadership. Lorenzen is a seasoned college hitter with experience as a solid relief pitcher. Due to his experience as a pitcher, Lorenzen possesses a strong arm, which combined with his speed and plus gap range make him a solid center field defender. With a good build (6-3, 195), Lorenzen has the room to gain more pop and has the approach to develop his hitting at the next level. Hart has the speed and defense to become a much desired outfield prospect come draft day. Hart offers phenomenal defensive skills and base-running ability, along with a compact, yet fast swing that generates line drives to all fields. He could be a serious sleeper come Thursday. Luck was certainly not on Boldt’s side this spring, as an injury in his first game of the season sidelined him for the rest of spring. However, Boldt has showcased his talents in years past and with Team USA, talents that include five-tool ability and great athleticism. Boldt, if given a chance by clubs, has the potential to become a solid, all-around player at the next level.